Here's a way to get some whole grains into your kids lunch box without them having a clue! 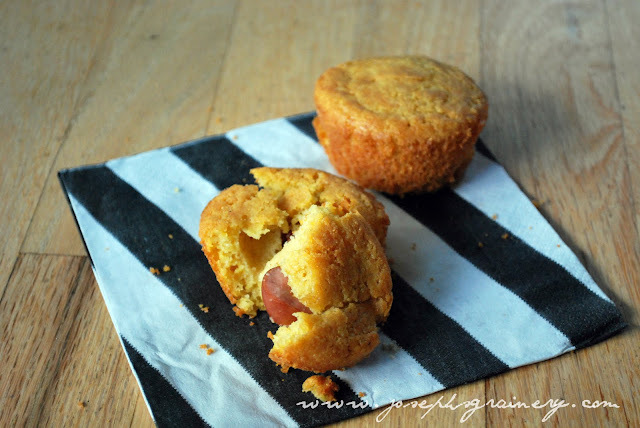 MaMa can't take any credit for the idea of Corn Dog Muffins, when she saw the recipe on In Between Laundry she knew she'd be making them with our Soft White Whole Wheat Pastry Flour. We used our Whole Wheat version of the Pioneer Woman's Skillet Cornbread. Rather than putting it in the skillet, we used our favorite muffin pan. Preheated the oven to 450 degrees and chopped up 2 hot dogs into bite size chunks and dropped them into the corn bread batter. Let them bake for about 20 minutes. I think any kid would be excited to find one of these in their lunch box! Thanks again to In Between Laundry for the inspiration!